Does my son have Lyme Disease? MyLymeTest | Real People’s Stories – Does my son have Lyme Disease? Real People’s Stories – Does my son have Lyme Disease? We moved into our “dream home” in Wisconsin last November. Everything was perfect–except for the ticks. I have been outside in wild places all my life and I have never experienced anything like this. The sheer volume of deer ticks is astounding. 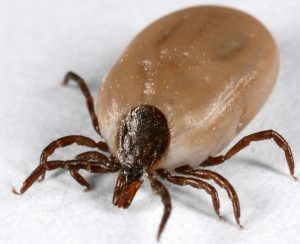 I always check the kids for ticks before bed, especially if they’ve been playing outdoors. One spring morning I found a deer tick on my 8-year old son. It was an engorged adult. I removed the tick and used alcohol to cleanse the wound. Two weeks after the bite, he spiked a fever that prompted me to visit the pediatrician. She ordered a strep test and at my request, a Lyme test. Both were negative. I was told to monitor my son and give him acetaminophen if his temperature remained elevated. The low-grade fever lasted a couple days. My son was exhausted which I attributed it to end-of-school stress. A week later I noticed a red mark under his eye. It looked like he was poked but he and his teachers confirmed that nothing had occurred. The mark faded and then a few days later a similar mark appeared on his cheek. I thought it might be a bug bite–small white dot in the center, slightly red around. I called the doctor and described the rash. She said to monitor it and it faded a day later. A few days later I noticed three distinct circular rashes on his back. I called the doctor and scheduled an appointment for the same day. By the time we got there the rash had spread to his extremities. They ordered another Lyme test that day, and started a four week course of amoxicillin. The Lyme test came back positive. The first two weeks of antibiotics went well and he seemed to be improving. For the second two weeks, improvement was not apparent, and he started complaining of headaches. My son finished his antibiotics and I returned to the doctor for his follow up. Every one of my questions to the physician were met with the same response, “He was treated appropriately. We followed the guidelines put forth by the CDC.” In response to the headache complaint, she said make sure he is drinking enough water. Ok, I am reasonable, that is not implausible, so I started keeping a log of what he was eating, how much he was drinking and sleeping. Eventually he got back to normal. Now the past week I noticed two splotches on his cheek near his jaw bone, they went away, later there was a red line that extended from the outer corner of each of his eyes. It started very red, and faded as it curved across his cheek, later there were more splotches, this time on the other cheek. All these markings went away before I took him to a new doctor. He hasn’t had any fevers. He has a cold and that doctor said it was probably a viral rash from the cold. She said we could do a repeat Lyme test. I asked if it wouldn’t still be positive from the spring bite. Uncertain of the answer, she went to confer with a colleague who agreed that the Lyme antibodies would still be present. This did not inspire my confidence. The physician told me that if it were a reinfection, it would be an atypical presentation for Lyme. I reminded her that his symptoms were consistent with his previous infection. We never tested for any of the other infections that I know can be transmitted with the tick bite. I don’t want to go looking for trouble, I have actually stopped trying to learn about Lyme on the internet, I feel like every place I read some different conflicting information. But, I saw marks on his face, I can’t pretend that I didn’t. Due to state laws we cannot provide human testing to residents of the states of NY, NJ, RI, MA or MD.